The Life of Jonathan Martin, of Darlington, Tanner, written by himself. 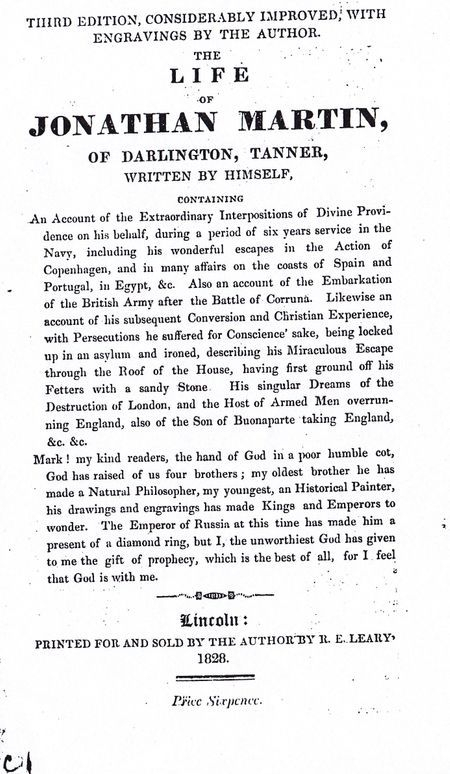 Containing an account of the Extraordinary Interpositions of Divine Providence on his behalf, during a period of six years service in the Navy, including his wonderful escapes in the Action of Copenhagen, and in many affairs on the coasts of Spain, Portugal, and Egypt. Also an account of the Embarkation of the British Army after the Battle of Corruna. Likewise an account of his subsequent Conversion and Christian Experience, with Persecutions he suffered for Conscience' sake, being locked up in an asylum and ironed, describing his Miraculous Escape through the Roof of the House, having first ground off his Fetters with a sandy Stone. His singular Dreams of the Destruction of London, and the Host of Armed Men overrunning England, also of the Son of Bonaparte taking England. God has raised of us four brothers; my oldest he has made a Natural Philosopher, my youngest, an Historical Painter, his drawing and engravings has made Kings and Emperors to wonder. The Emperor of Russia at this time has made him a present of a diamond ring, but I, the unworthiest, God has given to me the gift of prophecy, which is the best of all, for I feel that God is with me. Following his escape, Jonathan initially returned to working as a tanner for three months at Boroughbridge. During this time, one night in September 1821, he had a premonition of his wife Martha in bed “all in a gore of blood”. A few days later he received a letter confirming she had died of breast cancer on that very night. Early in 1822, he moved to Darlington, where he worked yet again as a tanner, joined the Methodists and began preaching in earnest. 1825 saw the printing and publishing of the first edition of Jonathan’s autobiography, ‘Life’. It was a small and very poorly printed pamphlet of fifty-six pages with an estimated five thousand copies. A much larger “Second Edition, considerably improved”, consisting of eighty double-columned pages featuring major additional text and three copperplate engravings, was printed the following year. A final third edition of five thousand copies was printed in 1828. By the end of that year, when he still had a few copies of the third edition in hand, he had sold fourteen thousand copies in total. He travelled throughout the north of England preaching and hawking his book, causing much disturbance and curiosity.